Parley Hawaii: Cleaning Up "Away"
Where is away? In this case, it's a remote string of islands in the middle of the northern Pacific Ocean, home to the endangered Hawaiian monk seal. Removing plastic pollution and marine debris from this region poses a unique set of challenges. Research, direct action, collaboration, and a giant shipping container make the impossible possible. With help from Sustainable Coastlines Hawaii (SCH) and the NOAA Hawaiian Monk Seal Rescue Program (HMSRP), a Parley x SCH shipping container is being filled with ocean plastic and fishing debris intercepted from Midway Atoll and surrounding islands, islets, and shoals. Once full, the container and recovered ocean plastic materials will be distributed to Parley partners for use in recycling, research, and awareness initiatives than can help close the loop on the cycle of destruction. The Northwestern Hawaiian Islands (NWHI), also known as the Leeward Islands, is a chain of small islands and atolls located to the northwest of the islands of the Kauai and Niihau, as part of the Papahānaumokuākea Marine National Monument. Endemic to the Hawaiian islands is the critically endangered Hawaiian monk seal. For the past 13 million years, the Hawaiian monk seal has thrived in the waters, coral reefs, and atolls of the Hawaiian Islands. In just the past 50 years, however, their population has fallen more than 60 percent. The adorable species is under increasing threat from human-driven climate change, overfishing, and plastic pollution. 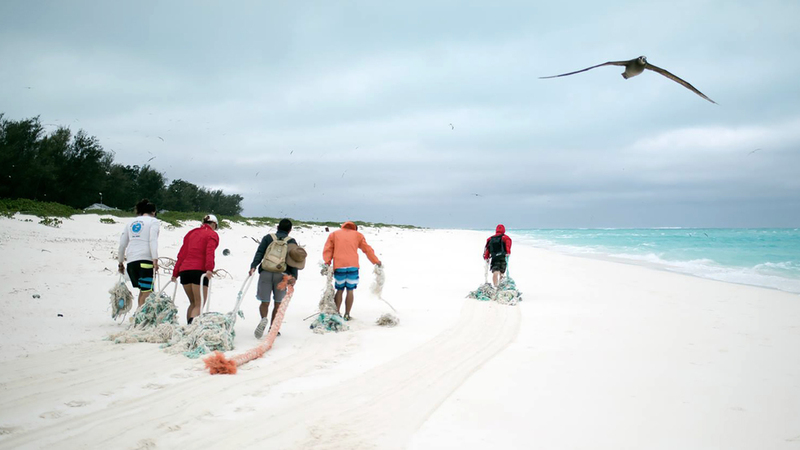 Despite being approximately 2,000 miles from the nearest continent, plastic from the nearby Great Pacific Garbage Patch and debris from commercial fishing activity is deposited daily on the shores of Midway Atoll and surrounding islands. Contrary to a popular myth, there is no garbage patch continent of plastic waste floating in the middle of the Pacific Ocean. The infamous “patch” is actually a massive, swirling gyre of plastic soup, where plastics carried by ocean currents accumulate and break apart into smaller and smaller pieces. There is now a gyre in every ocean. What doesn’t sink to the sea floor or wash ashore disappears into the marine food web, or traps and entangles vulnerable marine life. The consequences are heartbreakingly clear on the shores of these islands and in the populations of seabirds and seals that call them home. An estimated 80 percent of marine debris is from land-based sources. The other 20 percent is comprised of shipping and boating debris and lost and discarded fishing gear. Due to their bathymetry and remote location, the NWHI are especially vulnerable to pollution, acting as a sieve for flotsam and pollution. The risk of entanglement from fishing nets and other marine debris poses a major threat to the survival of the already endangered monk seals. Hawaiian monk seals have one of the highest entanglement rates of any pinniped species. From 1982-2014, a NOAA research team found a total of 347 seals entangled in marine debris, of which 237 (68 percent) were rescued. Among reported instances (not counting those that go unseen offshore), baby seal pups are the most often entangled. There are only about 1,100 Hawaiian monk seals left in the world. 90 percent of their population lives in the remote atolls and islets of the NWHI. The overarching goal of the NOAA HMSRP is to achieve an optimal and sustainable Hawaiian monk seal population. Through a collaborative effort, we can immediately reduce one of the animal's most imminent threats. Every item of marine debris and shred of plastic removed from these habitats could save a life. Every piece counts. Thank you to everyone working to keep the islands of Hawaii beautiful and plastic-free! Stay tuned for updates on the cleanup progress and Parley x SCH container journey. Midway Atoll is is a 2.4-square-mile atoll roughly equidistant between North America and Asia, almost halfway around the world longitudinally from Greenwich, UK.